The next generation of fashion leaders from around the globe will gather for this year's Copenhagen Fashion Summit, where young talents will draft and negotiate the first-ever United Nations resolution on fashion. In the days prior to the global sustainable fashion event, Copenhagen Fashion Summit, students from around the world will gather in the Danish capital for the fourth edition of Youth Fashion Summit taking place on May 9-10, 2017. Young industry talents will engage in discussions about the challenged industry they will soon inherit and about how to address the major problems of fashion manufacturing and consumption. At last year's Youth Fashion Summit, the students explored how the 17 UN Sustainable Development Goals (SDGs) represent opportunities for companies to align their sustainability goals with broader societal aims: from gender equality and poverty reduction to responsible consumption and climate action. This year, the same students have been invited back to transform their ideas and demands for corporate action on the SDGs into a proposed UN draft resolution - the first-ever concerning fashion. The resolution will be negotiated with industry leaders such as H&M and Swarovski, and NGOs such as Greenpeace on May 10, 2017 before being presented on stage at Copenhagen Fashion Summit on May 11. Later this year, the resolution will be presented to the UN in New York. "This year we are truly proud to support the Youth Fashion Summit, to empower the voice of future generations, who will continue to lead this fight for a sustainable fashion industry in the years to come," says Nadja Swarovski, member of the Swarovski Executive Board. 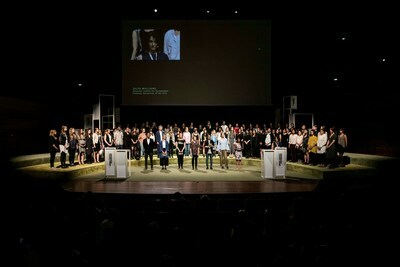 While the Educators Summit is a platform for teachers to exchange ideas and experiences on how to effectively teach sustainability and to build a strong international network around it, the Academic Leaders Roundtable convenes the most influential decision-makers from across fashion education, industry and non-governmental organizations for an intimate discussion informing the development of sustainability in global fashion. Both events, which will take place on May 10, 2017, are being held in partnership with the Centre for Sustainable Fashion.